Date | Time Wednesday, Feb. 13 | 7:05 p.m.
Saginaw, Mich. – The Firebirds travel 40 miles north for this season’s final battle with their in-state rival, Saginaw Spirit Wednesday night. Puck drop for game eight of the I-75 Divide Cup, sponsored by Coors Light, is set for 7:05 p.m. (ET) at the Dow Event Center (capacity 5,527) in Saginaw. Wednesday is ‘Arts, Hearts, and Spirit’ at the Dow Event Center. Fans can stay after the game to bid on a painting of Firebirds’ captain Ty Dellandrea. It was painted by two professional painters, the McMath brothers and all proceeds benefit the Saginaw Art Museum. 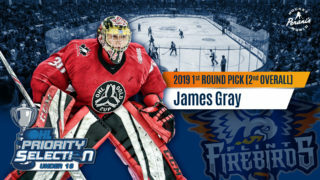 There are 10 players with NHL ties between both Flint and Saginaw’s current rosters Wednesday night which include the Firebirds’ Dennis Busby (Arizona Coyotes) and Ty Dellandrea (Dallas Stars) and the Spirit’s Brady Gilmour (Detroit Red Wings), Damien Giroux (Minnesota Wild), Blade Jenkins (New York Islanders), Ryan McLeod (Edmonton Oilers), Ivan Prosvetov (Arizona Coyotes), Owen Tippett (Florida Panthers), Reilly Webb (Detroit Red Wings) and Bode Wilde (New York Islanders). Six more players between the two teams are among the 50 OHL Players in NHL Central Scouting’s Midterm Rankings’ ‘Players to Watch’ list for the upcoming NHL Draft in June. Saturday marks the fourth and final meeting in Saginaw this season and the eighth of eight total match-ups during the 2018-19 regular season. All-time, Flint is 11-18-0-2 against Saginaw. In away games, the Firebirds are 4-11-0-0 versus the Spirit. The two clubs played in Saginaw on Saturday, Feb 2. Despite the Firebirds jumping out to a 2-0 lead in the first period, Saginaw finished with a 6-4 victory, including an empty net tally, in front of a sold-out Dow Event Center of 5,622 fans. Ethan Keppen scored two goals in the contest. Luke Cavallin made 47 saves on 52 shots between the pipes, and Jacob Winterton and Eric Uba each found paydirt. For the fourth consecutive year, the team who wins the most regular-season meetings between the two clubs will take home the coveted I-75 Divide Cup, sponsored by Coors Light. In each of the first two series, the Cup remained in Flint. Last season, the Spirit claimed the Cup, winning seven of eight meetings. The Spirit have won the first seven contests this season, thus tying the Cup series at two wins each. On special teams, the Spirit rank sixth in the OHL on the power play, scoring 24.4% of the time. The Firebirds are 19th converting at a 14.8% clip with the man-advantage. Saginaw ranks fourth on the penalty-kill, shutting down the opposition 81.1% of the time. 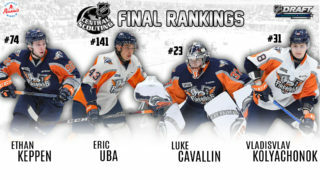 The Firebirds are killing penalties at a rate of 70.2%, which is also 19th-best in the OHL. Firebirds’ captain Ty Dellandrea (Dallas Stars) leads Flint in assists (36) and points (53) in 47 games. Alternate captain Jake Durham leads Flint in goals (32) and is second on the Firebirds’ roster with 51 points in 55 games. Ethan Keppen ranks third with 47 points (24G, 23A) through 55 contests. Keppen has earned points in 16 of his last 17 games, and is on a five-game goal-scoring streak (7G, 2A). Since Dec. 16, Jack Wismer has tallied 21 points (11G, 10A) in 21 games. Cody Morgan enters Wednesday’s contest on a four-game point streak and has 11 points in his last eight games. Second-year defenseman Riley McCourt has played in 37 games this season, and tops the defensive troops in goals-scored with five. He has 26 total points for the campaign. From the blue line, Vladislav Kolyachonok leads all first-year players with 25 points (3G, 22A) in 41 games. In net, overage goaltender Emanuel Vella holds a 4.86 goals-against average (GAA) and a .875 save percentage (SAV%) across 34 appearances. Vella has earned five wins on the season. Second-year goaltender Luke Cavallin has a 5.41 GAA and a .862 SAV% after appearing in 29 contests. Cavallin has four wins between the pipes. Cole Coskey leads the Spirit with 61 points (30G, 31A) in 48 games-played this season. Plymouth, Mich. native Bode Wilde (New York Islanders) tops the defensive squad and ranks second overall in offensive production with 13 goals and 41 assists through 46 contests. Recently acquired from the Mississauga Steelheads, Ryan McLeod (Edmonton Oilers) now sits third on the squad with 49 points (16G, 33A) in 47 games. Also acquired from Mississauga, Owen Tippett (Florida Panthers) has 47 points (24G, 23A) in 38 games. Tippett is tied for third in league in the category of ‘First Goals.’ He has scored the first goal of the game seven times this season. Cole Perfetti leads the first-year players on Saginaw’s roster with 22 goals and 26 assists, averaging just over a point-per-game through 47 contests. Between the Pipes: Ivan Prosvetov (Arizona Coyotes) hails from Moskva, Russia and was the 13th overall selection in the 2018 OHL Import Draft. He was selected by the Arizona Coyotes in the fourth round of the 2018 NHL Draft. Through 40 appearances with the Spirit this season, he has a goals-against average (GAA) of 3.04 and a save percentage (SAV%) of .906. His 27 wins are the third-most in the OHL, and his three shutouts are tied for second-most. First-year netminder Tristan Lennox has one career shutout, which was against the Firebirds earlier this season. He now has five wins in ten appearances this season, with a GAA of 2.58 and a .906 SAV%. Wednesday evening’s contest against Saginaw can be heard live on the radio throughout Flint & Mid-Michigan on US 103.1 FM, online at www.us103.com or by downloading the US 103 app here. Dominic Hennig will call the play-by-play action on the Flint Firebirds Hockey Radio Network. Pregame coverage will begin 35 minutes prior to puck drop at 6:30 p.m. The game will also be televised live across the province of Ontario on the OHL Action Pak in high definition on channel 458 for Rogers TV cable subscribers and channel 489 for Cogeco TV cable subscribers. OHL fans with cable television in Ontario can add the OHL Action Pak to their television plan to catch the Firebirds in action, home or away all season long. 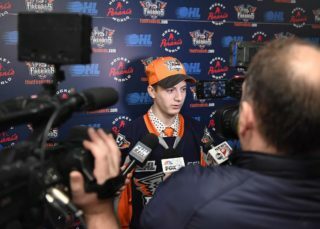 Along with Wednesday’s game, 65 of the Firebirds’ 68 games throughout the 2018-19 season are also scheduled to be televised live across the province of Ontario on the OHL Action Pak. Through Saginaw’s partnership, the game will also be televised on a tape-delayed basis on Sunday, February 17th at 8 p.m. (ET) on WNEM-TV5 Plus. The channel can be found on 5.2 via antennae over the air, channel 199 for Charter Cable subscribers and channel 4 for Comcast/Xfinity cable subscribers.